The Supervisory Board of Deutsche Bahn AG has adopted changes to the allocation of duties on the DB Management Board. 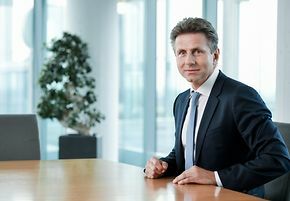 At its regular meeting in Berlin today, the Supervisory Board appointed Alexander Doll to serve as the new DB CFO in addition to his role as the head of DB's logistics and rail cargo division. Doll's new responsibilities will take effect on January 1 of next year. "Dr. Richard Lutz has served as both CEO and CFO for nearly two years," said Michael Odenwald, Chairman of the DB Supervisory Board, in Berlin today. "Our decision will give him the chance to focus in particular on the strategic development of the DB Group." The Supervisory Board discussed DB's current situation in detail at today's meeting, taking an especially close look at quality, service, punctuality and financial performance. The Supervisory Board will be holding a strategy meeting in late November, and the Supervisory and Management Boards have agreed that the Management Board will present a problem analysis at that meeting, as well as a strategy for the future of DB that builds on the analysis and includes further proposals for measures to take going forward. The objective will then be to ensure rapid implementation of the measures agreed.